Being on the north coast of France and not too far from Paris gives the ports of Upper-Normandy (or Haute-Normandie) a major advantage. As a result, Le Havre and Dieppe have both developed into important ports on international trading routes. However, Dieppe in particular, has retained its considerable charm with its attractive markets and friendly atmosphere. 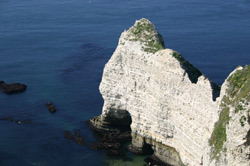 The area has a number of attractive seaside towns such as Etretat and Fecamp. And unlike much of the coast further west, the area boasts white cliffs to compete with the UK's own not too far away in Dover. Wherever you go, the region reveals new attractions. With its timber-framed houses, majestic ruins of abbeys, chateaux and churches, and the soft light of the Seine, it's no wonder that artists found the area a source of inspiration. Although a large amount of Upper-Normandy is quite urbanised, this is still largely an agricultural area - with 45% of the region dedicated to arable farming. Amongst many other products, the area produces apple juice, calvados and the rather sweet Benedictine liqueur. The easiest way to get to Upper Normandy is to go by ferry to Dieppe or Le Havre, or even Ouistreham (Caen) in Lower Normandy. The Channel Tunnel is another option. Should you wish to fly, the nearest airports with direct flights to/from the UK are the Paris airports and Le Touquet, depending on where in the region you need to be. Being so close to both the UK and Paris makes Upper-Normandy a very popular place amongst British second home buyers. Nevertheless, it is still possible to find properties at a reasonable price. Do you know Upper-Normandy better than we do? Do you have photos of Upper-Normandy? The Eure can often seem like a suburb of Paris. It is true that the development of Paris has had a dramatic effect on the department but look closely and you will find the small towns with the traditional Norman feel to them. It is also here, within the Seine valley, that you will find Monet's garden. Not only is the Seine-Maritime an intriguing destination due to its history and architecture, its proximity to Paris and incredibly easy access from the UK means that it's ideally placed for the growing British buyers market. The department has ports in Dieppe and Le Havre and a TGV station in Rouen. Criel sur Mer is a peaceful and attractive village near the sea in Upper Normandy in northern France. Perfect for holidays, it's easily accessible from the ferry ports and offers plenty to see and enjoy for all ages and tastes. The city of Dieppe is located in the north of France, in the department known as the Seine-Maritime. It began life as a small, fishing town, but became an important port of the English Channel and the focus of much activity during the world wars. Today Dieppe is a seaside resort, and it still retains elements of all these three functions. Elbeuf is a town that is located in Upper Normandy, in the north of France. It lies on the left bank of the River Seine, and is an attractive and affluent town that is a hub of industry and commerce. The town of Étretat, which lies in northern France, is famed for its fantastic cliffs and limestone chalk arches which draw visitors from all over the world, and which have inspired great painters such as Claude Monet. A popular seaside resort, Étretat is a typically attractive Normandy town, which is well set up to cater for both its residents and visitors. Evreux, in Upper Normandy in northern France, is a delightful and ancient town surrounded by some of the most stunning and famous gardens in France. Set in the spectacularly beautiful and fertile Norman countryside, Evreux, with its Gallo Roman remains, is one of the oldest towns in France. Fécamp is situated on France's northern coast, in the region known as Upper Normandy. It is a popular seaside resort as well as a functional and thriving fishing port. Its most famous building is the beautiful Benedictine palace, and Fécamp is also the place where you can discover the secret of the renowned Benedictine liqueur. The town of Forges les Eaux, located in the Seine-Maritime department of Upper or "Haute" Normandy, is a pretty spa town noted for the purity of its waters and for its fresh clean air. It has been a popular health and holiday destination since the 14th century, and the little town has lost none of its appeal for today's visitors. Le Havre is a large port town in upper Normandy, in northern France. The city is of architectural interest despite having lost many of its historic buildings during the Second World War, as when it was rebuilt after the War it was designed and constructed in Modernist style by renowned architect Auguste Perret. Le Havre is now considered a shining example of Modernist style. Le Tréport is a fishing village and lively seaside resort of the Seine-Maritime department in Upper Normandy, in northern France. With dramatic chalk cliffs, good beaches and a reputation for fantastic seafood, it's a perfect destination for all the family. Les Andelys is a town found in northern France, on a bend in the River Seine as it flows through the Eure department of Upper Normandy or Haute-Normandie. The town is probably best known for its chateau, built for Richard the Lionheart. Neufchâtel en Bray is a town that lies in the Seine-Maritime department of Upper Normandy, in a pretty rural landscape of apple trees and dairy pastures. The town of Pont de l'Arche, which is located in the north of France in the Eure department of the region of Upper Normandy, is a fortified town with a real place in the history of the wars between England and France. The town, which lies on the confluence of the Rivers Seine and Eure, is architecturally pleasing and beautifully kept, and its proximity to Paris makes it a highly desirable destination. The city of Rouen, which lies in northern France, is historically one of France's most important cities. It is here, amidst the half-timbered houses and mediaeval cobbled streets, that Saint Joan of Arc was martyred, here that William the Conqueror took his last breath, and here that the heart of Richard the Lionheart is entombed, as a mark of his affection for the great city. Vernon, set on the banks of the River Seine in the Eure department of northern France, is a dream of a town. It's often passed over in favour of a mention of its proximity to the famous gardens of Monet's Giverny, but anyone taking the time to discover Vernon for themselves, can only be won over by its historic charm. Haute-Normandie (or 'Upper Normandy') is in the north of France, conveniently positioned for both Paris and getting to and from the UK. WHICH DEPARTMENTS ARE IN Upper-Normandy?